The High Roller III machine incorporates features of both of our original models the High Roller and the EZ Roller mat rolling machines. 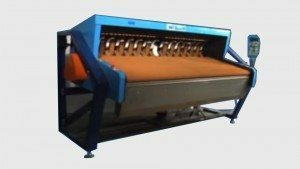 It provides the larger width design of the High Roller to roll wider mats and the ergonomic slanted bed of the EZ Roller for easier access and reduced strain on the operator. 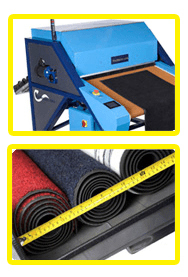 The large area single belt roller bed allows for inspection of the mat for quality before rolling. One operator operation – rolled mat returns to operator for put away. It can roll mats up to 6’ wide and 20’ long. From lift table, to roller, to storage the average operator can roll up to 165 mats per hour with ease – twice the average hand-rolling rate. voltages for operation plus isolation.